Dublin City Council says that the families will be housed in alternative accommodation. HOMELESS FAMILIES LIVING in emergency accommodation in Dublin have been told that they will have to leave at the end of the month, with no alternative living arrangements in place for them as of yet. 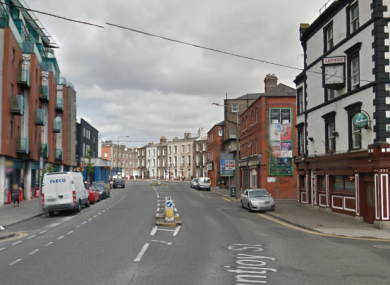 The people staying in a hostel on Mountjoy street in Dublin’s north inner-city were today told that they would have to be out by next week. Seven families with children, two single women, and three couples will have to be re-housed as the accommodation is being provided by a private landlord, but the provision will end at the end of the month. However, a spokesperson for Dublin City Council confirmed that it will have alternative accommodation in place for the families by the end of February. Dublin City Council are currently in the process of putting alternative arrangements in place for all households concerned and will ensure that there is emergency accommodation provided for them by the end of February. Aisling Kenny, who has lived in the accommodation with her partner and three children for the past nine months, spoke yesterday to TheJournal.ie. She said that she was only told the news about having to leave yesterday morning. “We were told we had a week to get out,” she said. My partner was going out the door to work when two men from the council stopped him and told him they were shutting down the building. She said that they weren’t told why they had to leave and that the council was “trying to find us alternative accommodation”. I’m trying not to think about what might happen if we have nowhere to go – I just hope alternative accommodation is found. Aisling said that she like the accommodation they were staying in. That it was safe and the staff were friendly. A spokesperson for DCC said that the families would be ‘re-accommodated’ in different accommodation. Whether that would be in a similar building, or in a hotel or other form of building was not yet clear. “What is very important to note is that if there is a change in the provision of emergency accommodation for families,” the spokesperson said. The local authority assessment and placement service (in this case the Central Placement Service, Dublin City Council) work with the families to provide alternative accommodation. Email “Homeless families told that they have to leave accommodation by the end of the month”. Feedback on “Homeless families told that they have to leave accommodation by the end of the month”.